Apparently, I was craving autumnal colors when I placed this order, and largely conventional patterns. There are two distinct genres here – Japanese and Traditional. 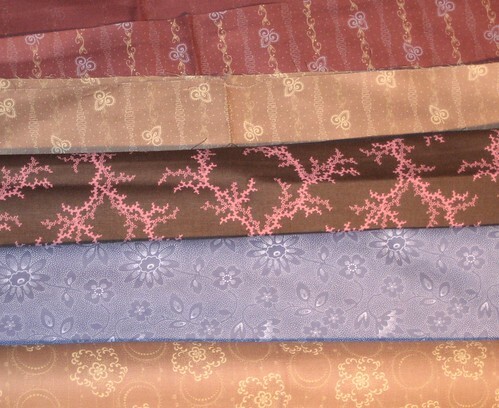 The Japanese fabric is hugely disappointing – the ink is raised and thick, and the fabric feels cheap. I get the sense the patterns are going to rub and/or wash off in relatively short order, which is quite a bummer. The traditional prints feel a bit better-made, although the fabric itself again feels on the thinner, cheaper side. At first, I was concerned they were polyester, but the website says, “100% supercombed cotton grown in the US.” Oh. Supercombed. Well then. Maybe I just don’t know a good thing when I feel it. 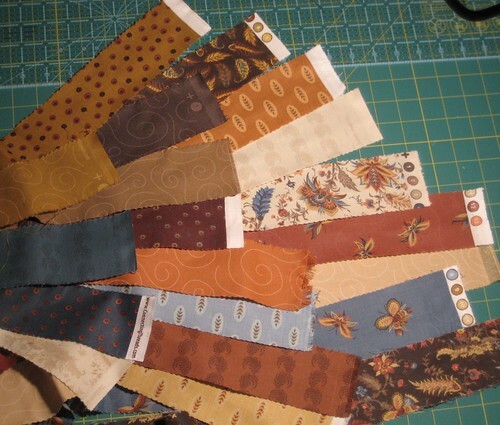 I also ordered a “jelly roll” of autumny colors – a bunch of strips that are about 3 inches wide by the total width of the fabric, nice for whacking into smaller shapes – it’ll save on cutting quite a bit. 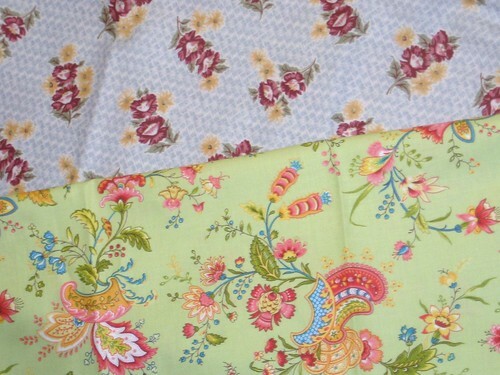 I can see these turning into a tablecloth, or place mats, or perhaps fall-theme kitchen towels. I may have been feel somewhat nostalgic when I grabbed these – they’re the same “country” colors from the house I grew up in during the 70’s – the browns, blues and golds. 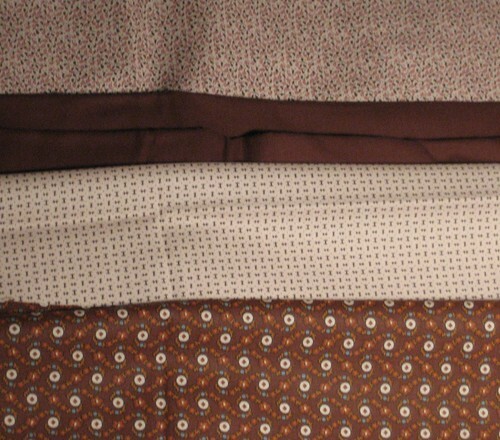 There was also a 23-fabric “charm pack” of Japanese prints, but they’re pretty awful. They look darling on the website, but the feel of them is just… sub-par. I have no earthly idea what I’ll do with them. 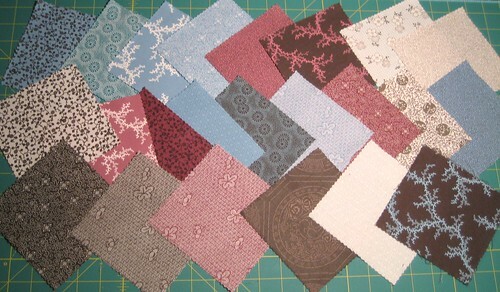 Anyone like pinks, browns and blues and want a patchwork something or other made? On the practical side, I ordered a much-needed rotary cutter refill blade (on sale) and two packs of small paper hexagons – even my subconscious is annoyed by the Teflon bits, I guess. These are quite small at 3/4″, and I’m interested to see if they’re any easier to manage. Lots more pre-washing and such in my future, the smaller bits in pillowcases to prevent unnecessary shredding, and I suspect the best is yet to come – the Anna Maria Horner stuff, hopefully with bright, cheery, fabulous colors. Too, it is immensely satisfying to simply gaze upon them all; vast swaths of unsullied color and pattern, so full of potential. I don’t want to ruin that potential. 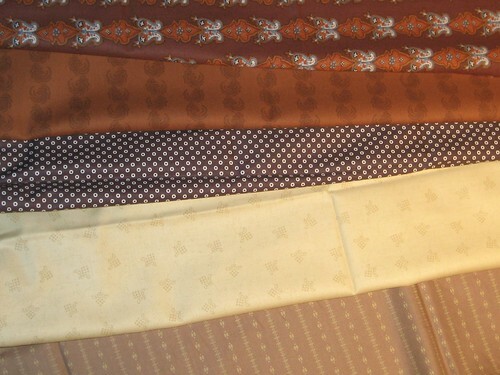 omg yummy fabrics! I saw those japanese ones the other night, and thought about buying them, but I could hear my wallet crying so I just closed the browser. that’s sad to hear they’re so crappy, they look awesome. I know what you mean about the decision paralyzation. I think that’s part of the reason why I haven’t actually sat down and *made* anything yet. I think it’s partly an act of courage, cutting into the fabrics and attempting to sew them – it’s terrifying. If I can rub my two remaining brain cells together, I’ll bring the Japanese charm pack in tomorrow so you can see what I’m talking about. Maybe they’ll pre-wash into something more acceptable, but overall… meh. I didn’t groan. Honest! You just need to get those bags out of your system before you move on. Besides, this isn’t work or school or the sewing Olympics. It’s playing with your blocks and fabrics and doing your own thing. 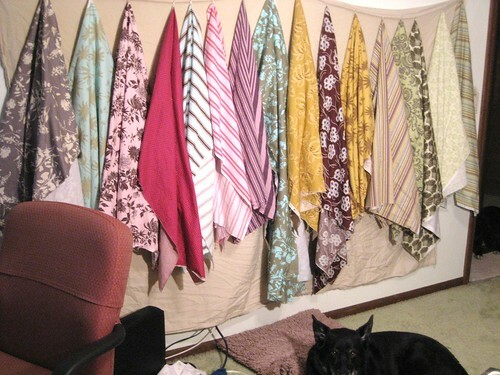 Even experienced quilters are sometimes terrified about cutting into their favorite fabric. I can’t say that you’ll get over it, but you’ll come to realize that if you mess it up you’ll find another way to make it beautiful.